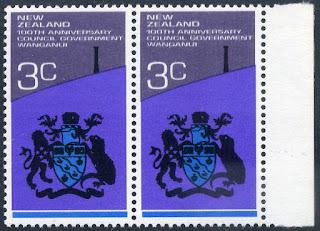 Up until 1972 New Zealand had been issuing Anniversary and Centennial stamps as these events occurred. 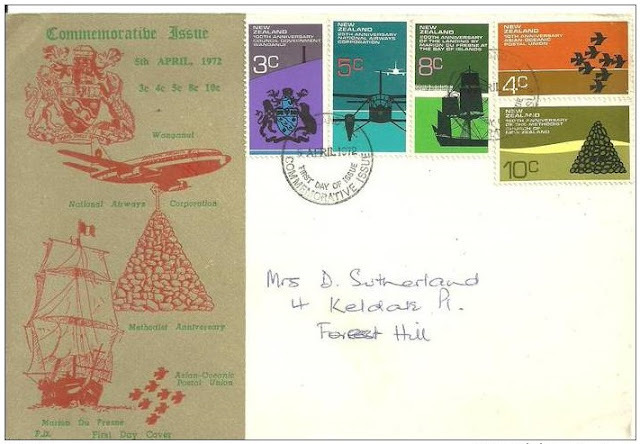 In 1972 it was decided to group these together to form a five stamp issue marking five different events. 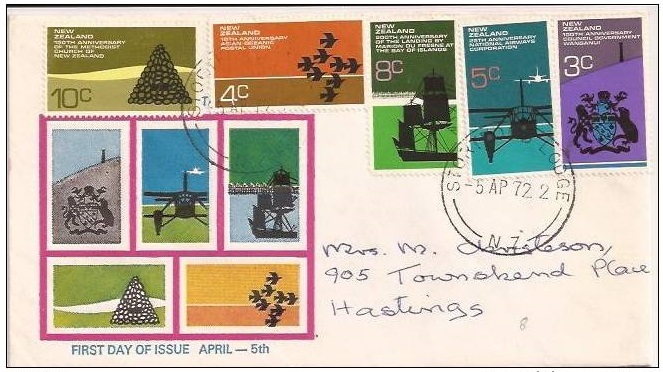 For many years the Anniversary Issue became a regular part of NZ Post's yearly stamp issues. The second feature of these annual Anniversary issues was that the stamps had a similar appearance even though each stamp represented a totally different subject. The common theme of this issue was bold silhouettes against colourful two-tone backgrounds. This can best be seen when the whole set is viewed laid out as they are above. 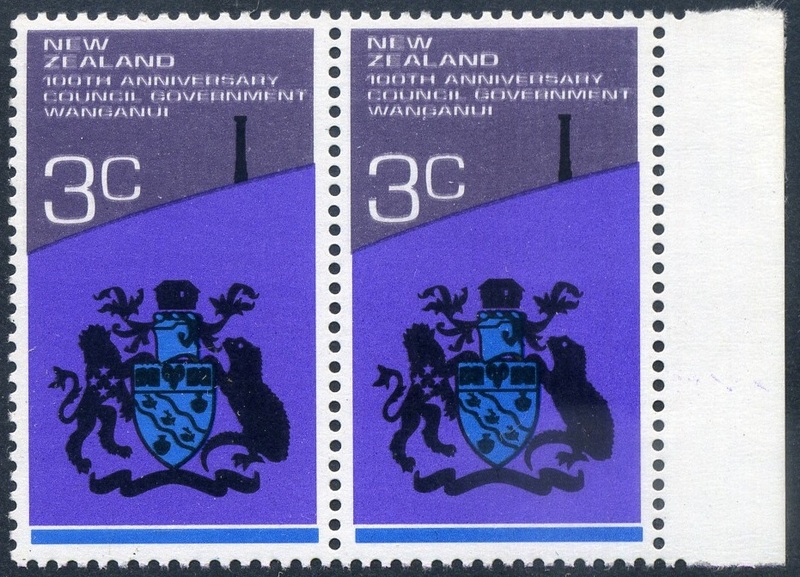 3c - Centenary of Local Government in Wanganui. Centenary of Local Government in Wanganui. The Borough of Wanganui was formed in February 1872, the town was originally called "Petre" but this was unpopular and the original Maori name Wanganui was adopted in 1854. The town received city status in 1924. The design features the city crest against a backdrop of Durie Hill with its memorial tower. 4c - Asian-Oceanic Postal Union 10th Anniversary. The 10th Anniversary of the Asian-Oceanic Postal Union. This organisation was formed at a meeting in Manila in 1962 with the object of co-operation in postal services of member nations - Australia, New Zealand, Taiwan, Japan, South Korea, The Philippines, Laos and Thailand. The design depicts eight stylised birds representing the members. 5c - National Airways Corporation (NAC) 25th Anniversary. The 25th Anniversary of the National Airways Corporation (NAC). The National Airways Corporation Act of 1945 established the National Airways Corporation to provide air services for the transport of passengers and goods within New Zealand. Depicted on the stamp are a De Havilland DH89 Dominie and a Boeing 737 aircraft. NAC was merged with Air New Zealand in 1978. See our post 2015 75th Anniversary of Air New Zealand. 8c - Marion du Fresne Landing 200th Anniversary. The 200th Anniversary of the Landing by Marion du Fresne in the Bay of Islands. In April 1772 the two ships of this expedition anchored in the Bay of Islands. The Maori were friendly and camps were set up on Moturoa Island. On 6 June du Fresne and 13 men went to visit a neighbouring village but were never seen again. The following day 12 men went ashore to search but only one returned. It is believed the French may have violated a native tapu. The design incorporates a silhouette of a 22 gun French frigate together with a portion of the Maori palisade at Motorua. 10c - Methodist Church in New Zealand 150th Anniversary. The 150th Anniversary of the Methodist Church in New Zealand. In January 1822 the Reverend Samuel Leigh arrived in New Zealand to start the Wesleyan Methodist Mission at Wesleydale Kaeo, North Auckland. In May 1822 he was joined by the Reverend William White. The stone cairn built by the Maori at Kaeo, Northland, to commemorate the site of the first Methodist Mission in New Zealand is depicted on the stamp. Two different First Day Cover designs. In this first example, the left-hand side bar shows symbols of all five subjects shown in the stamps. Notice also that both of these covers have been addressed and cancelled showing that these covers were mostly likely sent through the mail system. Now this First Day Cover show views of all five stamp printed on to the cover. When the actual stamps themselves have been added this had created a rather cluttered and confusing cover. Notice also that the colours of the stamps do not match those printed on the cover. A purple shift causing badly blurred wording in this selvage pair. This shift can also be seen in the thickness of the line between the two colour tones. 1967 - 1968 Decimal Pictorials - Part Four. 1967 - 1968 Decimal Pictorials - Part Three. 1967 - 1968 Decimal Pictorials - Part Two. 1967 - 1968 Decimal Pictorials - Part One.